The Gentleman's Magazine was founded in London, England, by Edward Cave in January 1731. It ran uninterrupted for almost 200 years, until 1922. It was the first to use the term magazine (from the French magazine, meaning "storehouse") for a periodical. Samuel Johnson's first regular employment as a writer was with The Gentleman's Magazine. The original complete title was The Gentleman's Magazine: or, Trader's monthly intelligencer. Cave's innovation was to create a monthly digest of news and commentary on any topic the educated public might be interested in, from commodity prices to Latin poetry. It carried original content from a stable of regular contributors, as well as extensive quotations and extracts from other periodicals and books. Cave, who edited The Gentleman's Magazine under the pen name "Sylvanus Urban", was the first to use the term magazine (meaning "storehouse") for a periodical. Contributions to the magazine frequently took the form of letters, addressed to "Mr. Urban". 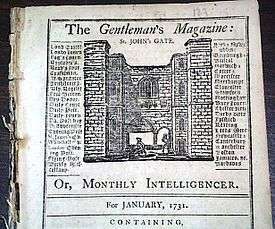 The iconic illustration of St. John's Gate on the front of each issue (occasionally updated over the years) depicted Cave's home, in effect, the magazine's "office". Before the founding of The Gentleman's Magazine, there were specialized journals, but no such wide-ranging publications (although there had been attempts, such as The Gentleman's Journal, which was edited by Peter Motteux and ran from 1692 to 1694). Samuel Johnson's first regular employment as a writer was with The Gentleman's Magazine. During a time when parliamentary reporting was banned, Johnson regularly contributed parliamentary reports as "Debates of the Senate of Magna Lilliputia". Though they reflected the positions of the participants, the words of the debates were mostly Johnson's own. The name "Columbia", a poetic name for America coined by Johnson, first appears in a 1738 weekly publication of the debates of the British Parliament in the magazine. A skilled businessman, Edward Cave developed an extensive distribution system for The Gentleman's Magazine. It was read throughout the English-speaking world and continued to flourish through the 18th century and much of the 19th century under a series of different editors and publishers. It went into decline towards the end of the 19th century and finally ceased general publication in September 1907. However, issues consisting of four pages each were printed in very small editions between late 1907 and 1922 in order to keep the title formally "in print". In addition to an index for each year of The Gentleman's Magazine, which was usually published with the December issue of the magazine, a full index was compiled by the College of Arms and typed by the Genealogical Society of Utah. This 75-volume index gives the full name and an abbreviated reference to the date, event, and any other person(s) in each entry. This index covers the years 1731–1850. The index is available at the Family History Library as FHL book 942 B2g Index and is also available on microfilm (films #599738-761, 24 films) or microfiche (#6026701, 126 fiche). An abstract of the "chief contents of The Gentleman’s Magazine from 1731 to 1868" was published by George L. Gomme in 1891. He describes it as "excerpts from the original publications containing local history and information, topographical details, and family history are presented here, organized into volumes by county". Gomme's work has been digitized and indexed by Ancestry.com and is available online to Ancestry subscribers or at subscribing libraries. Ayscough, Samuel; Nichols, John. "General Index to the Gentleman's Magazine" Nichols, 1789. Vol. 2. Free digital version at Google Books (follow link to page 64, which is followed by the index, which is numbered as page 1). Indexes names from Vol. 1 "To the End of the LVIth Volume of the Gentleman’s Magazine" and covers 1731–1786. David Dobson gleaned references to American births, marriages, and deaths from The Gentleman's Magazine and published it as American Vital Records from the Gentleman's Magazine, 1731-1868 (Baltimore, MD: Genealogical Publishing Co., 1987). Marriages from The Gentleman's Magazine for the years 1731 to 1768 were included in Boyd's Marriage Index. Obituaries were included in Musgrave's Obituaries. For those fortunate to have a surname beginning with a letter between Aa and Alexander, there is Joseph Foster's index to marriages, which includes marriages from this periodical as well as The Times (1865-1880 only) and the Historical Register. Bodleian Library's Internet Library of Early Journals offers an online subject search tool for the years 1731–1750. Thomas Faulkner (1777-1855), topographer of Chelsea, Fulham, Kensington etc. James Thomson (1700–1748), Scottish poet and playwright best known for his masterpiece The Seasons and the lyrics of "Rule, Britannia!" ↑ Heather A. Haveman. "Antebellum literary culture and the evolution of American magazines" (PDF). Poetics. 32. Retrieved 20 November 2015. ↑ Johnson, Samuel. "Magazine". A Dictionary of the English Language. JohnsonsDictionaryOnline.com. Retrieved 31 July 2012. ↑ "Marriages of the Nobility and Gentry, 1650-1880", an article in Collectanea Genealogica, 1881-1885. Bond, Donald. "Review: The Gentleman's Magazine" Modern Philology (1940) 38#1 pp. 85–100 in JSTOR. Kuist, James M. (1982). The Nichols File of the Gentleman's Magazine: Attributions of Authorship and Other Documentation in Editorial Papers at the Folger Library. University of Wisconsin Press (Madison, Wis.). ISBN 0-299-08480-9.
de Montluzin, Emily Lorraine (1996). "Attributions of Authorship The Gentleman's Magazine, 1731–1868 A supplement to Kuist". de Montluzin, Emily Lorraine (1997). "Attributions of Authorship in The Gentleman's Magazine, 1731-1868: A Synthesis of Finds Appearing Neither in Kuist's Nichols File nor in de Montluzin's Supplement to Kuist". de Montluzin, Emily Lorraine. "Attributions of Authorship in The Gentleman's Magazine (Kuist's Nichols File and Its Conversion into an Electronic Database)". Wikimedia Commons has media related to The Gentleman's Magazine. "The Gentleman's Magazine (1731–1833)". Eighteenth-Century Book Tracker. Retrieved 10 January 2016. The Gentleman's Magazine, archives at Internet Archive. The Gentleman's Magazine, archives at Google Books. "An Electronic Version of James M. Kuist's The Nichols File of the Gentleman's Magazine". Electronic Text Center at the University of Virginia Library. 21 April 2008. "Gentleman's Magazine" (PDF). Alan E. Mann. 21 June 2012.